Any contact I’ve had with state politicians and both councils has been positive. They want to work towards a good resolution. In 2008 I walked the tunnels with a good mate, and took some photos. At that time, to all intents and purposes it appeared QR had abandoned the corridor. Today, Queensland Rail advises that they are on private (state owned) property. Walking the tunnels is an experience. It draws you into the past. It makes you wonder about what it would have been like to be there when the tunnels were built. There is more information and photos about the tunnels here. I believe most of the work was done by hand, and the workforce must have had skilled engineers providing direction. While they would have used explosives, it must have been incredibly difficult and hard work with a pick and shovel. Details attract your eye – the outline of the boards in the concrete that were used as boxing when the concrete was poured leads you to think about mixing that concrete. No phone call to the batching plant in Gladstone to deliver a mix in those days. It is a fair distance from water, so that had to be carted up rough tracks, along with gravel and sand sourced locally. It had to be good clean stuff as well or the concrete wouldn’t last. Wall detail in a tunnel. Click for full size. The sleepers you are walking on have a round top. How unusual! These are genuine hog-backs, hand hewn from the hard dense iron bark trees growing on these stony spurs. The trees would have been many decades, perhaps 100’s of years old, only growing a millimetre or two each year on these hard hills. Your experience is really enhanced when you realize the sleepers are original, almost 100 years old. They have lasted because of the quality of the timber, and because they are protected from the weather in the tunnels. The truly remarkable thing is that the dog spikes which hold the rail down to the sleeper have kept their grip in the wood all this time, even with the vibration and shaking of the trains on the track. The best historical tourism is when the tourist can experience, and wonder about the past. The term ‘hog-back’ refers to the round shape of the top of the sleepers, this being the outside of the tree. The tree would have been felled somewhere near the rail line with a crosscut saw. 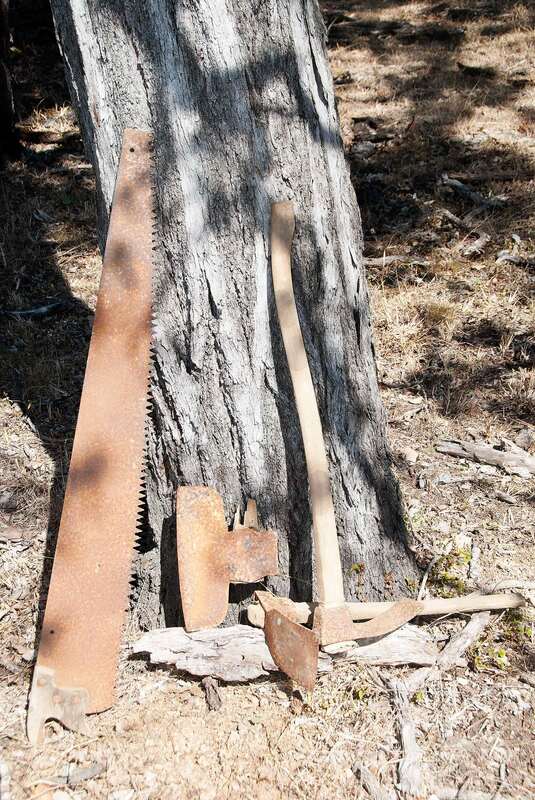 One man crosscut saw, a broad axe sans handle and two adze. These, along with a sledge hammer and wedges provided the basic tools to split and dress hogbacks. They were split from the tree using wedges, and dressed with broad axe and adze. The bed for the rail line is cut into the top of the sleeper with an adze. 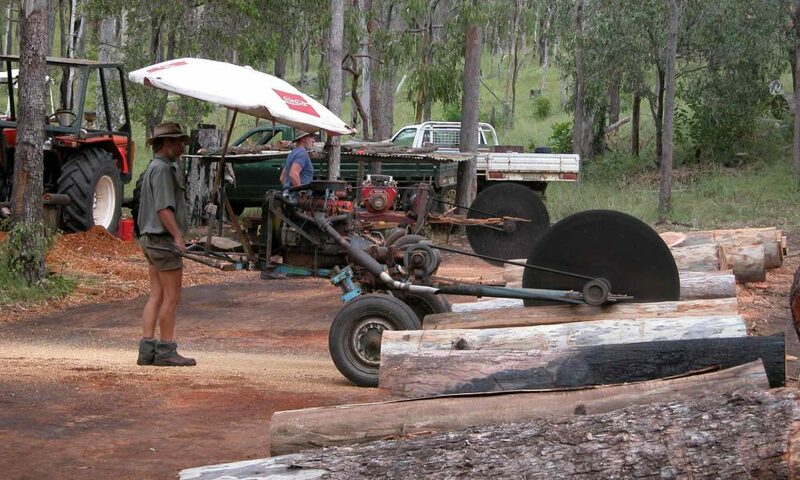 I cannot pin down a date, but going forward sleepers were generally sawn in a sawmill or in the bush using law saws. 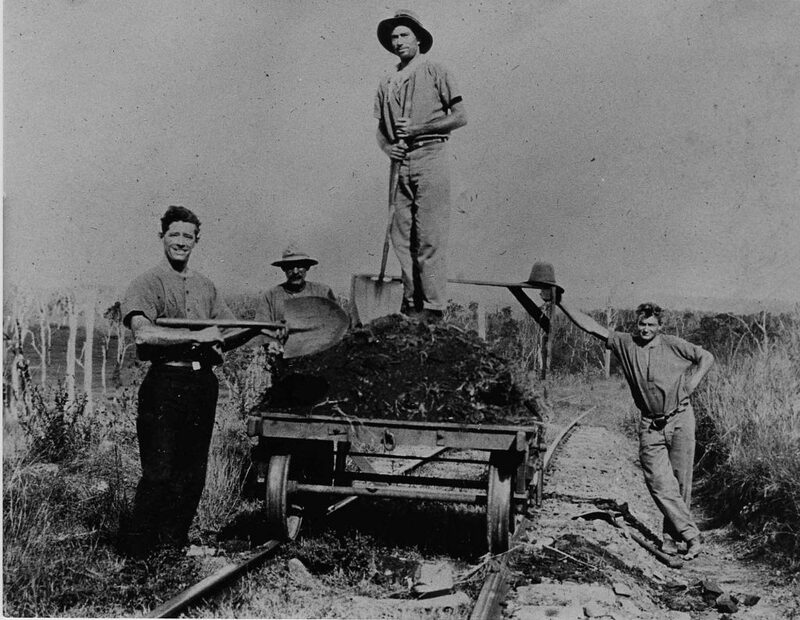 Sawing sleepers was a busy industry in the Boyne Valley, and in many districts in the forest country of Queensland, until about 2000. It was mostly done by self employed people, and provided a good outlet for timber on grazing properties. In times of drought or poor cattle prices it provided a good second income stream. ‘The train’ was an integral part of the communities along the corridor. From Many Peaks ore sent to Mt. Morgan , timber sent from the sawmills, cream to the butter factory, beef cattle to meatworks, pigs to market, groceries and supplies back to the local stores, children off to boarding school and passenger services to the bigger towns, many things revolved around the train. This all helps explain why the local communities place such importance on the rail, its sleepers and history. Apart from the significant numbers of people working on the rail as fettlers ( there were, I think, four gangs in the Valley) and station managers, there were many people involved in cutting sleepers or using the train services in their daily lives. It does not explain the reaction of people walking the tunnels who have had no association with the rail corridor. The interest in, and enhanced experience of seeing the hogbacks in place is remarkable. Leaving these hog-backs in place would would leave a testament to a society and people who lived along the corridor and a way of life now gone. It would be the only place rail and hogback sleepers are preserved on any of the disused rail corridors in the state, and is one of the most interesting places to do so. 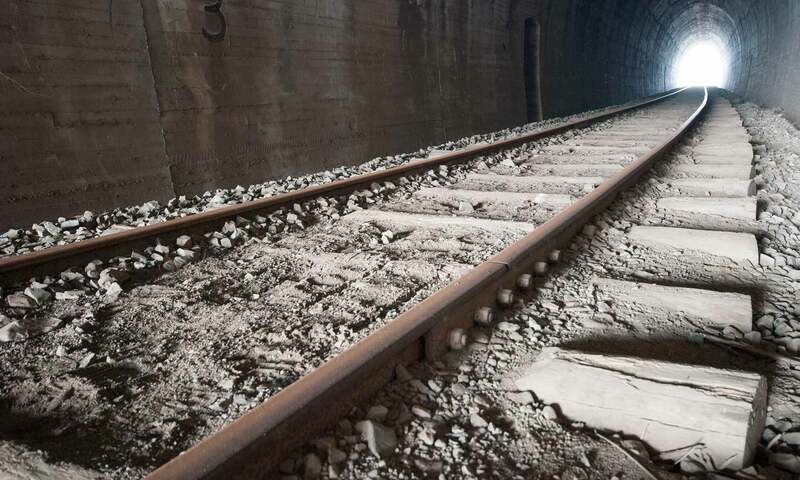 Not leaving some of the original sleepers and track in place will leave a hollow, empty experience in those tunnels. The interest in the tunnels and hogback sleepers has just happened, spread by word of mouth, especially over the past few decades. No doubt social media has played a part. Perhaps QR needs to put up a few signs advising it is private property for the moment. It is important to preserve the past at a local level. In the end it is the best way to showcase our combined history & culture. However, it is just as important to look forward. The experience of walking these tunnels with these hog-backs and rail in place could provide a great tourist attraction for the future. 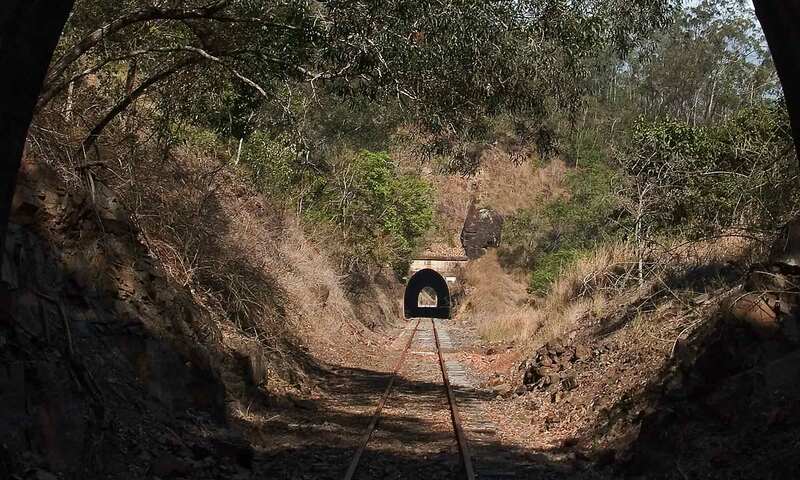 Absolutely the folklore and legend of the line and tunnels must be preserved, please Queensland keep this romantic little section of track at least from Builyan to the top of the range. 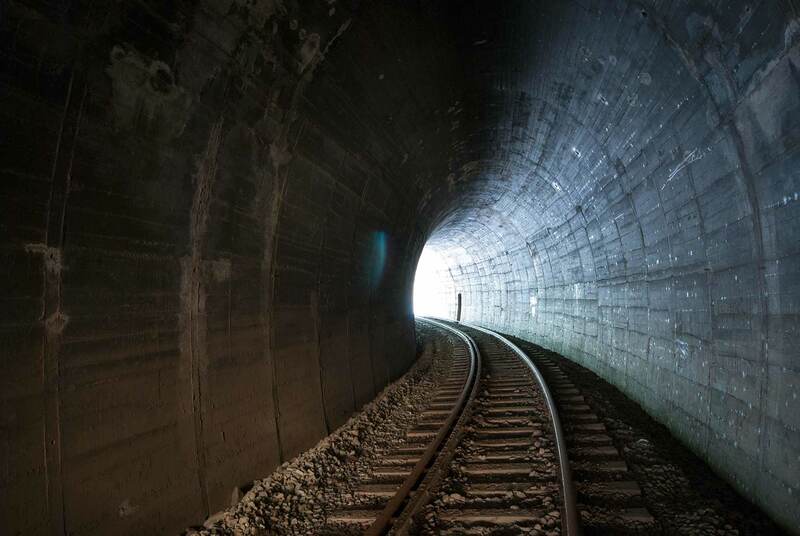 Traversing the line and tunnels will engage and connect visitors with the vision and industry of 100 years ago providing a real point of difference and must see drawcard for the coastal tourist trade. Would be a hit with day tours from Cruise ships visiting Gladstone. Funding is the key to preserving these tunnels. I believe there are 15 cruise liners due in Gladstone over the next 18 months. About 2000 people on each ship – that’s 30000 people looking for a unique experience to do in a comfortable day. I would think it would be possible to attract 20% of those tourists to the tunnels. 6000 people. There is a good earner for somebody, and a way for whomever assumes responsibility for maintenance of the tunnels to charge for per person use. Perhaps $10 pp added to the ticket cost for the day out. With family involved in the build, I’m very keen to see the tunnels, line and sleepers remain in the tunnels. It’s some fantastic history and, in my opinion, needs to be kept. Without the line and sleepers, that rich history disappears…and can’t be reversed! Keep up the great work with the group and the website. your direct connection to the build is really interesting. I have read that up to 100 WW1 diggers from the Kalpower end also worked on the construction. In time we hope to have those stories on the site as well. 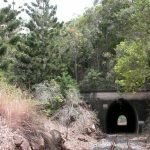 Government is always talking about bolstering tourism in regional Queensland, here is there chance to step up to the mark and preserve the tunnels in there entirety. This will benefit all of the small towns in the area, in turn also helping the town in the surrounding areas as tourists will spend as they travel. Hope this helps Mark. Most country towns and villages try to attract tourists in some way by showcasing their history. Although all are different, in some ways they follow similar themes. This is unique and different, and will bring a fresh stream of tourists to all those attractions. Research shows 30,000 pa (not a typo) could be realistically expected to use the Trail if we can keep the important attractions. As a nation we have preserved so little of our historically significant structures and now have the opportunity to preserve an important and unique part of our national history. In preservation of one or all of the tunnel sections we open up the opportunity for tourism to flourish in the area. Tourism today is integral to the survival of many rural areas and ours is no different. With a lack of services provided by local, state and federal governments we are losing residents hand over fist. Tourism though could very well be our lifeline. What a sad Australia we would be without our tiny rural towns that allow us to momentarily step back in time and appreciate the pioneers and builders of our Nation. It would be a travesty should these tunnels and their workmanship be lost to us all. I remember going to Port Arthur in Tasmania, which was excellent. Walking through those old structures filled me with wonder about what it would have been like back then. The tunnels and hogbacks might not be as old, but they have the same effect when walking through them. Absolutely this historical rail trail should be preserved for generations to come. The hog-back sleepers are something that will never be seen again. 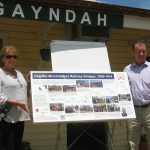 This is such an interesting read, about what was and what could be with preserving the tracks and creating tourism in the community. You are right about the hogbacks. From my small amount of research, I don’t believe they exist anywhere else. Great write up about this important piece of history from our region. These historic hogback sleepers and rail line must be preserved along with the tunnels otherwise it loses its character and meaning. All to often the powers that be make decisions to get rid of important history from smaller rural areas without considering the impact it can have on the the area as a whole and the effect on the people and their connection to it. My grandad was a fettler on the railway in this area and my family has a personal connection. Preserving this wonderful local history is a must. Thanks Marg, Jenny & Jim, that support from government is crucial. A great idea and certainly well worth support from all levels of government. Enjoyed reading your history of the tunnels and the sleepers. 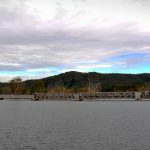 I think history will be important to not only the locals but others who will be attracted to the region to ride or walk the trail. It’s important to maintain the history of each locality along the way. That’s what draws people in. We’ve ridden rail trails in Qld, NZ and Victoria. The individuality of each little town along the way is what makes the memories. Can’t wait to get out there and ride! thank you, and to previous commenters for your support and kind words. With a bit of luck we will have a good positive response from the powers that be. Definitely an important part of our heritage. Would love to see the rail and hogbacks preserved and the trail freely accessible to the public. “The Best Historical Tourism is when the tourist can experience and wonder about the past”. If retained will be greatly appreciated by future generations!! Fabulous write-up Mark. We are all behind saving these historic reminders of our past. Previous PostPrevious Boyne, Burnett cycling.